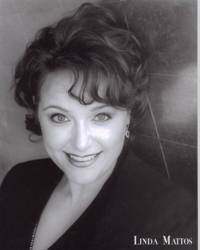 Twice Metropolitan Opera Audition Regional Finalist, Linda Mattos, soprano, has been seen as �Zerbinetta� in Ariadne auf Naxos and �Rosalinda� in Die Fledermaus with the Seattle Opera Guild Previews, �Rosina� in the Barber of Seville with Rogue Opera, �Gretel� in Hansel and Gretel with Kitsap Opera, �Micaela� in Carmen with Obsidian Opera and �Nedda� in I Pagliacci with Art Haven. Ms. Mattos was recently seen as the Soprano Soloist in the Mozart Requiem with the Northwest Sinfionetta. Upcoming performances include the �Queen of the Night� with Art Haven of Seattle. Ms. Mattos lives in Bellevue, WA.